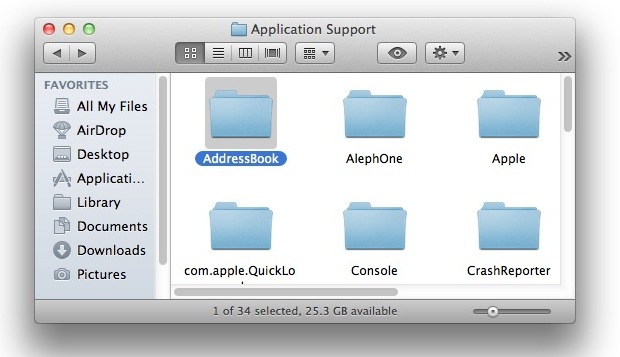 Whether you just use OS X’s Mail.app on a Mac, or an iPhone, iPad, or iPod touch, the Address Book in Mac OS X stores a lot of vital information that you don’t want to lose. If you’re going to be making any changes to how you sync this data, adjustments to where and how it’s stored, or just want to move it to another Mac, here’s how to back up the address book and all data inside so that you won’t lose anyones contact information, avatar icons, and any other details you have about those stored in your address book. This will cover backing up the address book in OS X using the export feature and a manual file back up. The resulting .abbu file can only be read by Address Book, but it’s easy to reimport by going to File > Import. This file can then be stored for backup purposes, or if you just want to move or copy Address Book data and contacts to a new Mac but not include all of the other iPhone Backup files, this allows for that too. The quickest way to get there is by using Command+Shift+G and pasting that directory path in. You’ll want to keep the entire folder and its contents, so copy it elsewhere or just archive the entire thing to move somewhere safe. It is definitely recommended to backup the Address Book one way or another before you do anything dramatic, I’d even suggest doing so before syncing with Google Contacts or anything similar, just to be safe with your data. Another good use here is to export the file and to then reimport on your other Macs so that your contacts lists are consistent across multiple Macs. This will be achieved through iCloud as well, but if you don’t plan on using the service then manually doing so is always an option. Is this also backed up using Time Machine? Yes, Time Machine backs up everything on your Mac unless you specify otherwise. Wow….. thanks…. I’ve been wondering how to do this pre-iCloud. Frustrated that I couldn’t plug my phone into my laptop and sync contacts the other way. How about iCal? Same thing? Searched all over the place for this, every site kept saying just goto ~/Library/Application Support/AddressBook folder, except when I you try and find it in finder I couldn’t find it. The key is to use Command+shift+G. I want the last hour back searching for that folder. Thanks for the tip. I back up my Address Book Archive regularly by copying it to a flash drive. I do this approximately every two weeks (in addition to running Time Machine backups). Something strange has just happened that has never happened before. I customarily delete the previous Archive when I copy over the latest version. One prior Archive will not delete. No matter what I try, it stays in my Trash. My only option is to move it back onto the flashdrive, along with the last Archive. Any idea what is going on and how I can this now undeletably earlier Archive? I use an old iMac running Snow Leopard. To emphasize: I’ve done what I am describing for years and have never had a problem until now. (e.g. the address book & calendar) . . .
can I reveal the hidden files of interest?